Dubbed the "breakout breaststroke star at Nationals," Emory swimmer Andrew Wilson is taking the swimming world by storm. 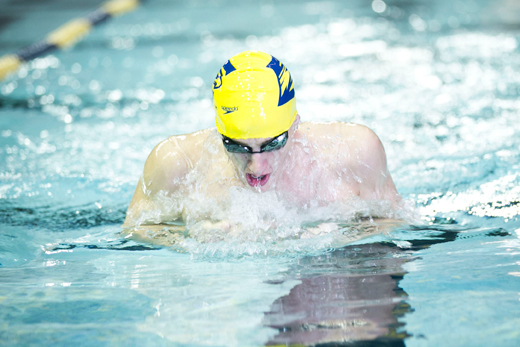 Emory student Andrew Wilson won the national championship in the 100-meter breaststroke and placed third in the 200-meter breaststroke at the 2015 Phillips 66 USA Swimming National Championships, held Aug. 6-10 in San Antonio, Texas. Wilson took first place in the 100-meter breaststroke on Aug. 6, with a time of 59.65 seconds, a shade faster his time of 59.68 seconds in the preliminary rounds earlier that day. He was the only competitor out of 83 entries in the preliminary round to finish the 100 meters in less than one minute. His time would have qualified for the U.S. team in the 2012 Olympics and made him the sixth fastest American of all time. In the 200-meter breaststroke, Wilson posted the fasted qualifying time Aug. 10, clocking in at two minutes, 9.84 seconds. (Olympic medalist Michael Phelps placed sixth with a time of two minutes, 12:68 seconds, although he was swimming an event that is not usual for him). Wilson placed third in the championship race Monday night with a time of 2:10.35, fractions of a second behind winner Craig Benson (2:09.68) and second place Will Licon (2:10.02). Phelps placed fifth in the final race. Wilson's sub-minute 100-meter swim was "sending shock waves through the swimming world," and he "displayed a mastery" of the 200-meter event in the qualifying races, Swimming World Magazine wrote in its coverage of the championships. In another story, the magazine dubbed Wilson "the breakout breaststroke star of Nationals." Wilson has already qualified for the 2016 U.S. Olympic Trials in both the 100 and 200 breaststroke. The Olympic Trials, set for June 26 through July 3, 2016, in Omaha, Neb., will determine who represents Team USA in the 2016 Summer Olympics in Rio de Janeiro, Brazil. “Emory is where I got really serious about swimming,” Wilson said in an interview earlier this spring. A rising senior from Bethesda, Md., Wilson is majoring in physics and applied math. This year, he was named the National Collegiate Athletic Association Division III Men’s Swimmer of the Year, after winning three national championships and setting new division records in the 200-yard individual medley, 100-yard breaststroke and 200-yard breaststroke. Keeping with Emory’s tradition of accomplished scholar-athletes, he was also named as a College Swimming Coaches Association of America Team Scholar All-American in 2013 and 2014, and as a Capital One/CoSIDA Academic All-District Team member in 2014 and 2015. Wilson has been training with Longhorn Aquatics at the University of Texas at Austin this summer. NCAA Division III rules prevent athletes from training with their school coaches outside of the season, Wilson explained in a video interview with swimming website SwimSwam. "I went down to Austin to train with UT at the end of the school year just to get a little bit different of an experience and get exposed to some new training, and it's been great," he said. "The guys are awesome, but I think a lot of the work I did during the school year with Emory transitioned into long-course season. It's really been a combination of both of those."